The idea of this project originally came from Tim (thanks mate for finding me a new project). 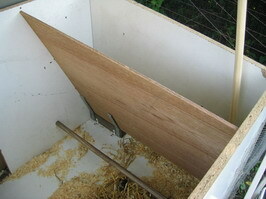 Although I have to visit my chickens every day (to get the eggs) I want an automated feeder system. Why? ….. just because it’s cool. I know there are many feeding systems available in the pet shop but I don’t want them to have access to the specialised food the whole day. Exposing them to an unlimited supply of grains, corn, … would stop them from eating my kitchen waste (and that’s why we bought them in the first place). 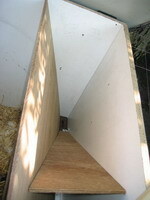 The idea is to mount a wooden plate in the chicken house to create a silo. At the bottom of that silo is a transport system to get the grains to the feeding place. The first system I made used the actual drill to transport the food. successful, the drill was able to transport the food and didn’t get stuck at any point. Making the actual model was a different story though. 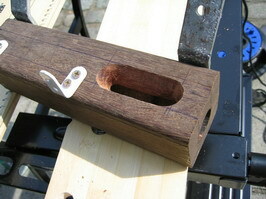 Since I was afraid of the wooden block wearing out by the drill I used a piece of tropic hardwood. On small remark though: tropic hardwood is HARD!!! Using the drill to transport the food had a very high throughput of food but there had to be a drawback. When a piece of grain or stone got caught between the drill and the wood the whole system jammed and I had to turn it back manually to solve that. In real life this would mean my chickens would starve. The new transport is system is so simple I could believe it would work until I saw the whole system running. Instead of the drill I have a spiral made from metal wire that is about half the diameter from the hole in the block. It runs freely in the hole without any resistance and pulls the grain out at a steady rate. The throughput of food is less but I can let it run for a longer time to get the correct amount. This is the block of wood that is the core of the system. The grain will fall in the slot you see on top and it will be transported to the hole at the right side. There are already mounting brackets in place to make the installation quicker. A sunny	Sunday is all it takes to go shop for the needed tools and install the system. 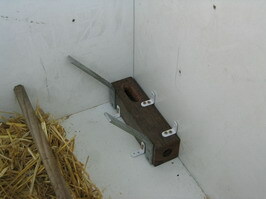 The transport block is installed in the corner of the house using L-shaped mounting plates. 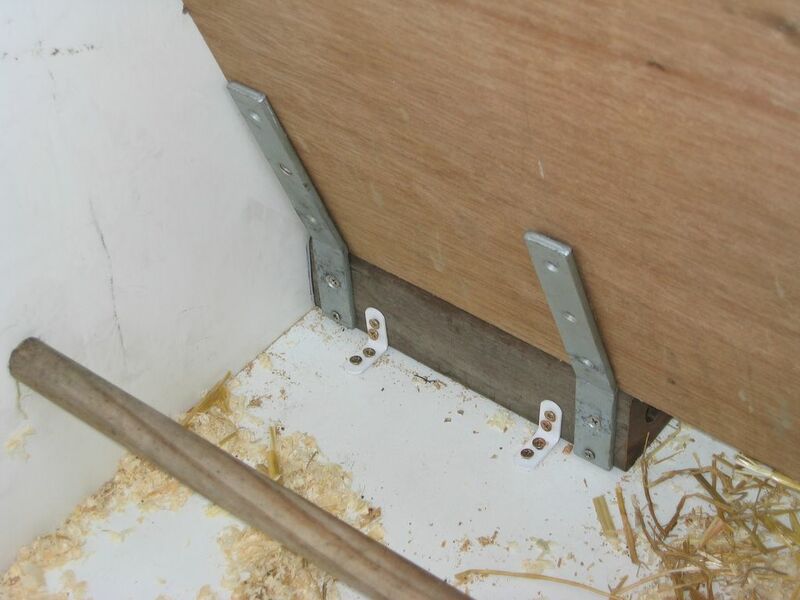 It is needed to drill a hole in the hardwood first where the screws will come because getting a standard screw in is impossible. The motor is be mounted against a large L-shape mounting plate that already had a slot of 10mm width where the shaft fits in. 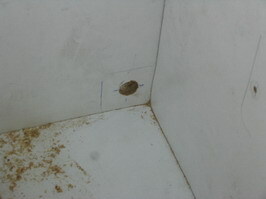 I had to add a small piece of wood because the part where the shaft came out was slight bigger then 10mm. 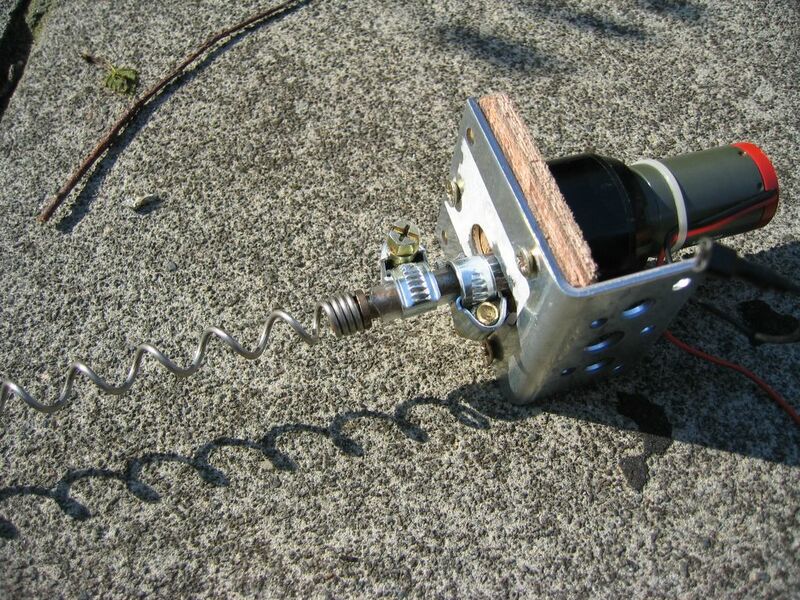 A small piece of tube and two clamps will firmly connect the spiral to the shaft of the motor. 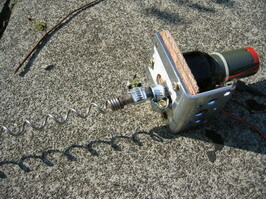 The spiral is passed through the tunnel and the motor is mounted so there is enough space to let the clamps turn freely. Because we used plastic tube to connect them, it can buffer any variations in the movement. 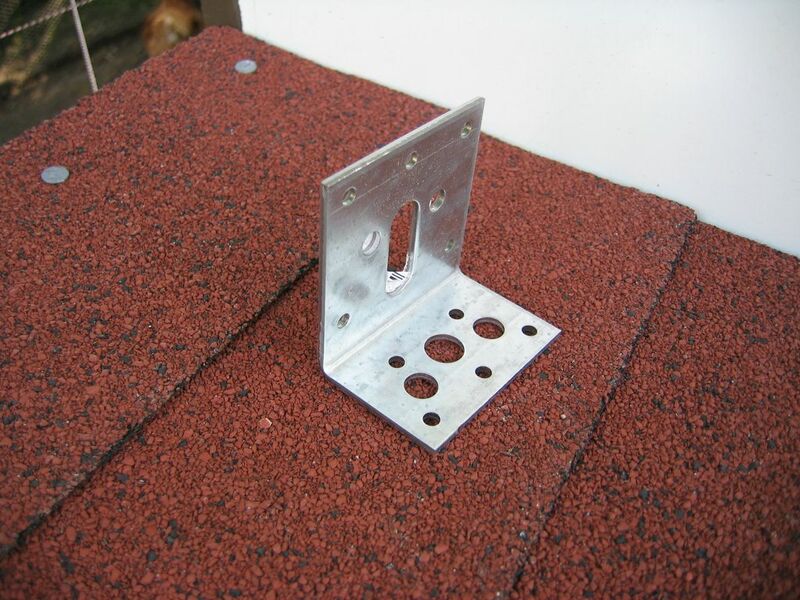 At the sides of the transport block there is are two L-shaped mounting plates that were bend to a much bigger angle of about 165Â°. 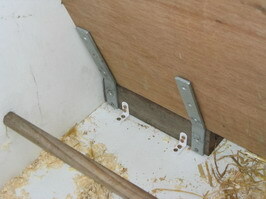 These will hold the side plate to create the food silo. What’s nice hardware without some software behind it to make it all happen? I had to find a controller that would run independent, consume almost no power, turn the system on at the desired time and turn it back off once enough food was delivered. Inside the whole system consists of 3 parts: the power plugs, the digital part and the small circuit board that changes 240V AC to 24V DC and 3V DC and switches the relay. The 24V is used to drive the relay so we won’t be using that, the 3V is used to power up the digital part and that is what we need. 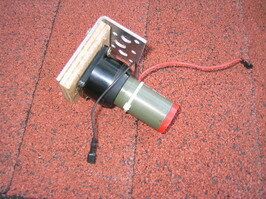 Since the current consumption of the motor is very low I can switch it using a transistor only. I used a BC547C (NPN transistor) because they can draw 100mA and my motor only needs about 30mA. 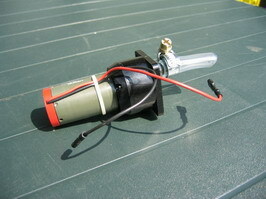 The internals of the timer are completely stripped out and only the digital part remains. 3 wires are coming out of that PCB: 2 for power and 1 control line. It took my a while to discover how the control line was working but after I while it became clear that it was connected to ground through a transistor when the system was off and disconnected from ground when the system became active. To use that signal for controlling a transistor I only needed to add a pull-up resistor between the positive supply and the base of the transistor. 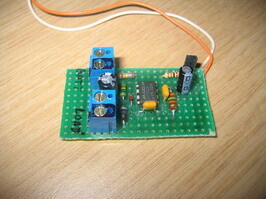 This circuit worked fine but it had one major disadvantage, it consumed about 20-25mA. This is too much for a system that has to run on batteries. The next challenge was to get the power consumption to a level where it could run on batteries or solar panels. Making a small calculation I found that I lost about 177mW of power in the LM317. That was an efficiency of less then 26% (later I found that it was even worse than that). Linear power regulators have the problem that they transform the complete voltage difference between input and output to heat. The obvious solution was a switching power supply. MAX5033. It requires some, easy to get, external components and should have a much lower consumption. The result of this chip were magnificent, the consumption dropped to 2.5mA !!! With the new controller in place the system should work for about 200 days on a 16Ah battery. I will add solar panels as well in the future but for now I’m happy the way it works. 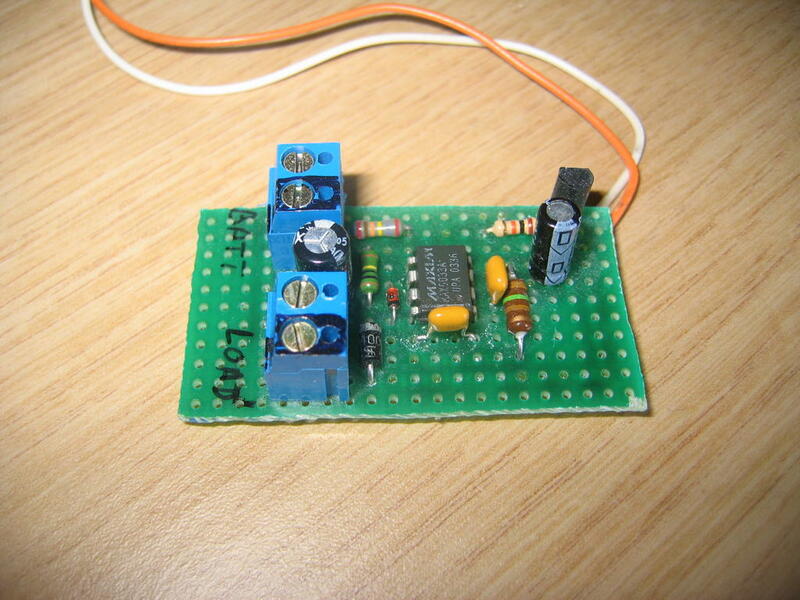 On the photo you can see the MAX5033 with the components to transform the power from 12V to 3.3V. On the top right is the transistor that switches the motor, there is also a diode in reverse over the motor connection to absorb any reflow of current. The transistor BC547C can draw 100mA and since my motor only consumes around 30mA this is more then enough. When you want to use a bigger motor you might need to use another transistor or a relay. Right now the system turns on at 8.05h in the morning and runs for 11 minutes, that way the chickens get the same amount of food as before. This article has been reposted with permission of Tom Boschman. I’m all for making things easy. 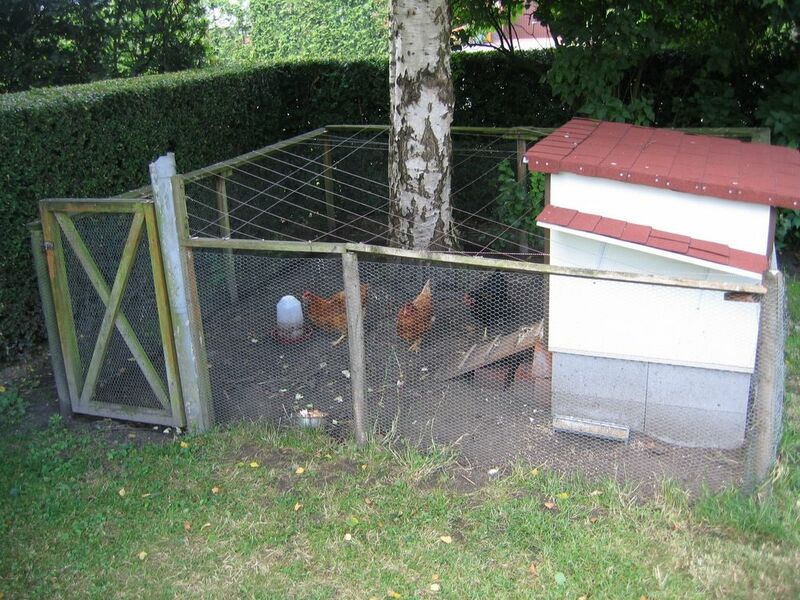 You can use chickens as part of a permaculture system, where the chickens fertalize, weed, and till the ground all at the same time. Best of all, minimal work for you. Move their pen, and you can plant next year’s crops there. What could be better than letting them fend for themselves? 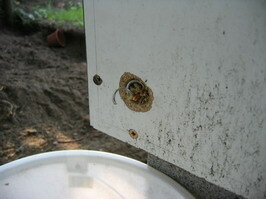 Just check on their food every week or so, and get the eggs at your leisure. I have been thinking about making one of these for a while. I have experimented and failed thus far. 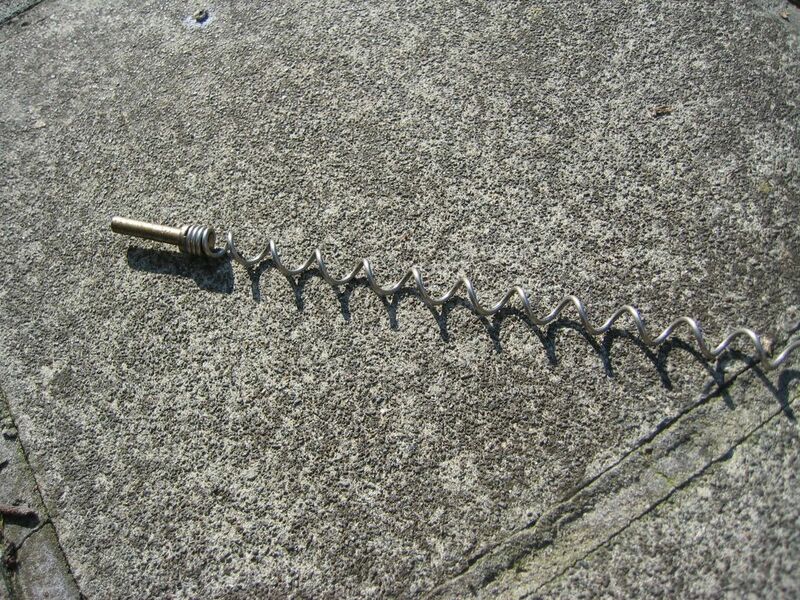 The loose spiral wire is brilliant. I would like to know more about the project eg. its layout please. Cool idea. It’s a shame ‘stevo’ is quick to stomp on your creativity. and dedication to turning his ideas into reality – yeah, right. what name did it have! many thanks! p.s this site is great and i find it 1st pages on google lots! 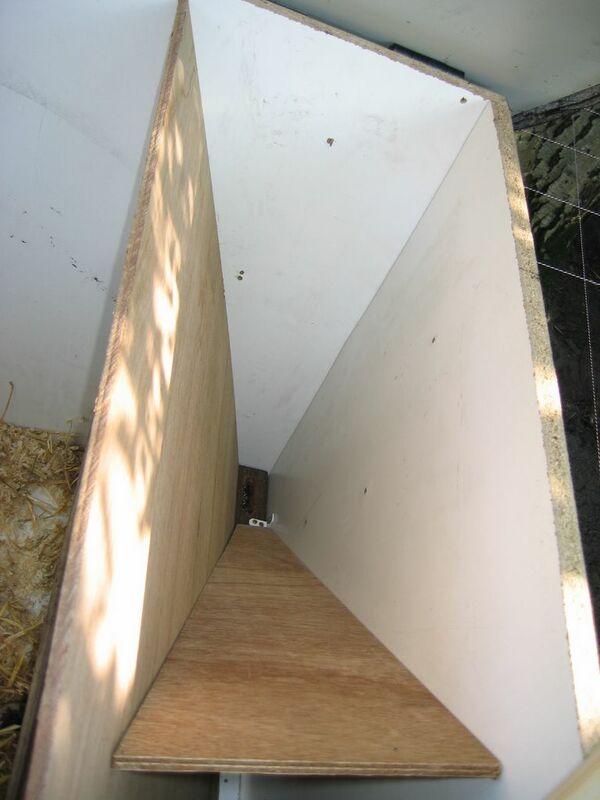 This puts me in mind of a device I’d like to have for my chickens: an automatic coop door openercloser that would be triggered by light level. That awy I would be able to go away overnight knowing my hens would be shut up tight at night and let out at sunrise. Sadly I am mechanically deficient, so it remains a dream. Fantastic. I’ve made a chicken feeder where, when a chook steps onto a plate, a door opens giving the chook unlimited access to food. 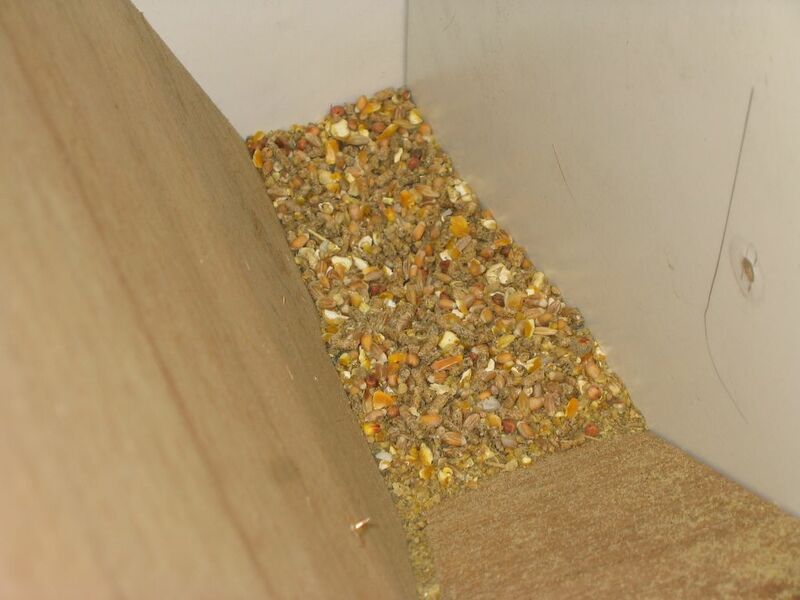 The closed door stops feral birds and mice from getting a free feed. 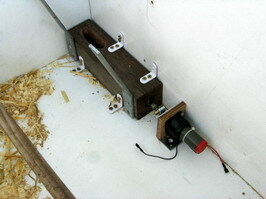 My next project is an automatic door that lets them out at midday and closes on dusk. Any body got a design (circuit diagram for a timer and LDR input)? I guess Stevo can’t read or conceptualize a basic concept. 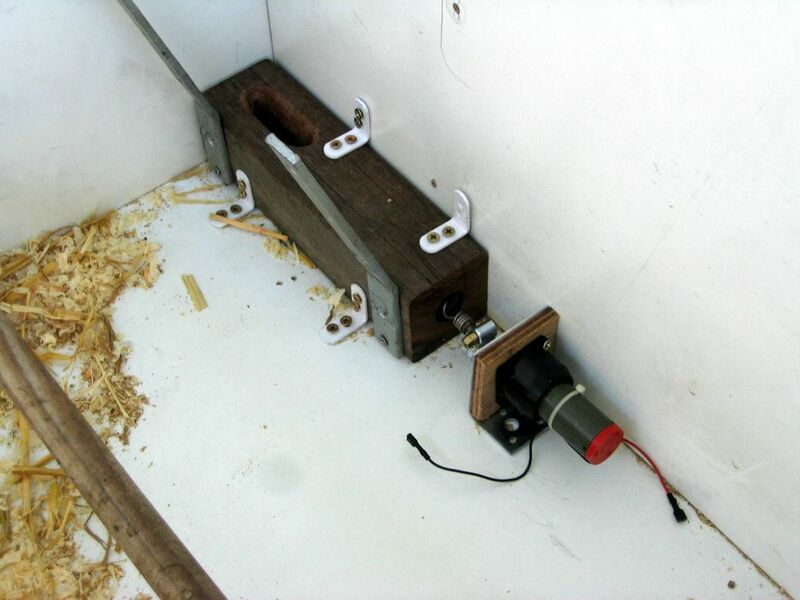 Hi Tom : I love your ideia,and using the it IÂ´m thinking that could solve my problem to feed two aviaries gages with cocktaiels and finchs that I have, when I went out of my house on weekends and hollydays.I intend to make a smaller one of this feeders working like yours. What do you think ? i have never seen a chook choose grain over a lovely pile of kitchen scraps. i think this device is clever but not really needed. I use gravity a feeder and it does not work because the chicks drag all the feed out in 10 minutes thinking there is something better in there. As for your rude comment all I can say is get a brain you bum. Great I was looking for this, as I’m Leaving for hollidays, this will be a perfect project before getting off. -In reply to the gravity lovers, I understood that with this solution the chicks will eat the grain all day, wrather than just around feeding time in the morning.